NOW AUTOGRAPHED BY GEORGE LYNCH - All NEW Digital Re-Master DVD - George’s guitar clinic in Milan Italy 1995. Originally recorded on a camcorder and bootlegged around the world (the Mob Shop has it cheaper than the bootleggers charge for it!). This stunning performance has been salvaged and restored to viewable and listenable status. George jams to material developed for the return of Lynch Mob, as well as some Lynch classics. George states "It’s Virtually Clam-Free!" The cover features George dressed as the Pope! All Stars of Rock Guitar features over 3 hours of lessons from 4 guitar masters: George Lynch (of Dokken and Lynch Mob), Bruce Kulick (of KISS and Grand Funk Railroad), Jennifer Batten (of Michael Jackson Band, Jeff Beck Band, and a solo artist), and Darrell Roberts (of W.A.S.P. and Five Finger Death Punch). Each artist discusses their influences and demonstrates some of their signature techniques along with cool lead and song-writing methods. Learn advanced chord structures and tapping with Jennifer, lead guitar and song structures with Bruce, and metal licks and rhythm techniques with Darrell. Plus, watch George lay down lead tracks for his upcoming solo release. This 2-disc DVD set is packed with exciting bonus features including appearances by Dario Lorina, Jack Ripper, and Yayo Sanchez. NOW AUTOGRAPHED BY GEORGE LYNCH - The SGR George Lynch Instructional video is here and now exclusively available at the Mob Shop on GeorgeLynch.com! Sacred Groove Merchandising is proud to feature this much sought after video, formerly titled "REH Video", with all of George's most defnitive signature licks and riffs. George demonstrates all of his guitar techniques. Among them are shapes, tapping, string skipping, vibrato and tremolo bar licks. Also included is behind-the-scenes footage of George recording solos to songs from Lynch Mob's debut album "Wicked Sensation." NOW AUTOGRAPHED BY GEORGE LYNCH - In this video George provides his prospective and insight on jamming and improvisation. Get a close-up view of his legendary technique. George discusses equipment and how he gets his sound. George lets loose on some stellar jams as he covers the styles of: Rock, Blues, Fusion and more. Also includes a live performance of "I Will Remember". This video was available only in Japan until now! Join one of the most revered rock guitarists of all times as he shows you the tricks and concepts behind his incredible rhythm playing. From Dokken to Lynch Mob to Souls of We, George Lynch will teach you how to play his most killer riffs! Plus learn how to expand your soloing skills with a variety of Lynchian rhythmic techniques. - ALL THREE AUTOGRAPHED BY GEORGE - Now you can order all three of George Lynch's videos for one great price. You get Guitar Bible, Open Jam, and Milan Clinic for the special price of $64.99 S&H offered on VHS and DVD-R. Take advantage of this special offer today! 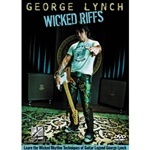 George Lynch Guitar Bible Video on DVD-R Learn all of Mr. Scary's licks, tricks, and techniniques. In this 45 minute video George covers warm-up, picking, vibrato, bending, whammy bar, tapping, and much more. Also featured are two live studio recordings of "Voodoo Chile" and, of course, "Mr. Scary". Previously only available in Japan, this video is a must have for any Lynch fan and anyone wishing to take their playing to the next level. George Lynch Guitar Clinic - Milan Italy on DVD-R George's guitar clinic in Milan Italy 1995. Originally recorded on a home camcorder and bootlegged around the world (the Mob Shop has it cheaper than the bootleggers charge for it!). This stunning performance has been salvaged and restored to viewable and listenable status. George jams to material developed for the return of Lynch Mob, as well as some Lynch classics. George states, "It's Virtually Clam-Free!" The hilarious cover features George dressed like the Pope! Open Jam Instructional Performance Video on DVD-R In this unique video, George provides his prospective and insight on jamming and improvisation methods. The emphasis is placed less on technique and more on capturing the "feel" for playing many different styles. George lets loose on some stellar jams as he covers the styles of Rock, Blues, and Fusion. George also discusses his equipment and how he gets his sound. Includes a live performance of "I Will Remember". This video was available only in Japan until now!